Ocean Sailing Yacht is a fine lined classic design for liveaboard cruising. Her size is just right for cruising with a family or a couple with friends. Construction is strip planking and cold molding. Custom accommodation plans are available to suit individual owner's requirements. Estimated cost for quality construction materials (not including power or sails) is $4 to $6 per pound. This cost includes a high level of outfit and finish you can be proud of after putting the effort into building this fine boat. Purchase Study Plans for the OSY 42 for $5.00 for delivery by US Postal Service [no download file available]. 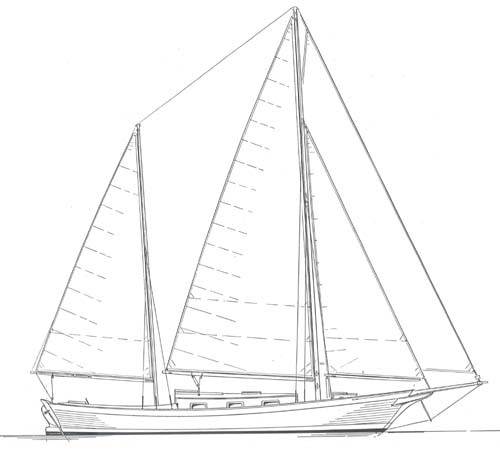 Purchase Construction Plans for the OSY 42 for $2,650.00 for delivery by US Postal Service.